The people want small hybrids, right? Thankfully, it appears that isn’t true. A report in Automotive News says that there is actually a very large demand for more performance cars. This is the sort of news that we like to wake up to. AN reports that performance cars serve a number of purposes. They have large profit margins, which is just good business and they’d naturally want to sell as many as they can. They also bring in a younger clientele, which every automaker wants and needs. Engineers love working on them, product people love evangelizing them, and journalists love driving them. It’s a win all around. An added bonus is that they make the lame family sedan in the showroom look suddenly fast and desirable. Detroit is embracing the trend more now than in the past, with Hellcats, Z06s, Focus RSes, and more, while the European automakers are staying the course with their tiered strategy. And it’s really paying off. The Hellcat duo from Dodge have nearly 9,000 orders in, far more than expected. Ordering is actually suspended so Dodge can verify and begin to fill the orders for what’s out there. This is great news. Also, yes, I used pictures of the Miata for this instead of pictures of a Hellcat. But we have these great Miata shots from our pal Puppyknuckles and we’re going to use them a lot. They’re awesome. Tesla has been fighting for ages against draconian dealer laws that see the electric car maker unable to sell its cars in certain states. One of the biggest places that is has been fighting is Texas. Well, Tesla hasn’t technically lost the battle in Texas, but it isn’t going well. Two bills that were supposed to go through the state legislature to change the ways that dealers operate there aren’t even going to see a vote. That’s how little influence they have. And Tesla reportedly has 20 lobbyists in the state and Elon Musk has been making large political contributions to get this passed. Maybe they’ll get it to go to a vote next time. Volkswagen is offering deals on the Jetta. Big deals. There is a two year lease plan out right now that sees the little sedan sell go for $89 per month. According to Bloomberg, that’s the same price as many monthly cell phone contracts. They’re doing this to lock in customers for two years, that way they have people on deck for when a new lineup is in dealers for 2017. VW’s goal is to double sales in the US by 2018 to 800,000 per year. They are going to need more than a cheap Jetta lease. They need a midsize crossover. Hopefully that’s coming soon. The recalls keep coming. The Takata airbag inflator issues are still rearing their head. While the 34 million cars that are being recalled get identified, GM and Subaru have added some more models to the recall. GM is bringing back 375,000 2007 and 2008 GMC Sierras and Chevy Silverados that could be impacted by the inflator issues. Subaru is bringing back 60,000 Imprezas from 2004 and 2005. That means they are also stuck fixing the Saab 9-2xs that were built during that time, since Saab is now in a state of not existing and Subaru built the cars anyway. The Buick Regal and Verano are swell little cars that aren’t selling as well as they should. Seriously, the Regal is a nice sedan, even in a trim that isn’t the high end GS. So, in order to make the cars sell better, Buick is offering a new trim level for both cars that cuts at least $2,000 from the list price. The trim, dubbed 1SV, gets the Regal’s price down to $27,990 and has an EcoTec four cylinder with 182 horsepower. The Verano 1SV is $21,990 and doesn’t have satellite radio, remote start, a backup camera, or Bluetooth. 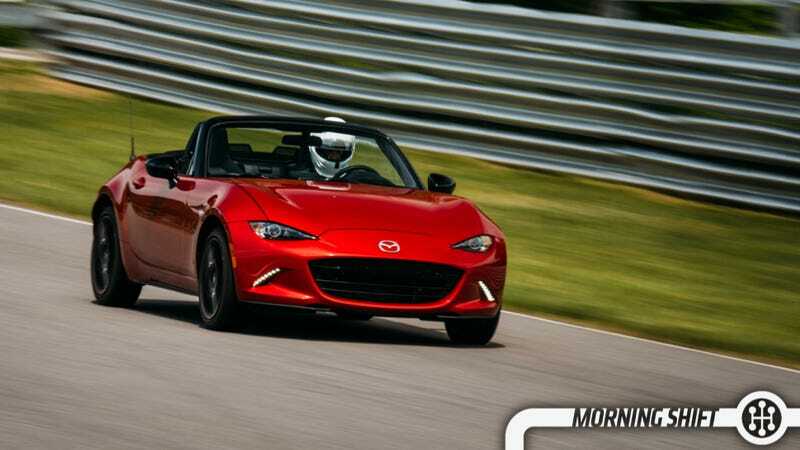 6th Gear: Our Miata Video Is Here! Watch this now to prep yourself for the full video later on this morning. On this day in 1934, the Tokyo-based Jidosha-Seizo Kabushiki-Kaisha (Automobile Manufacturing Co., Ltd. in English) takes on a new name: Nissan Motor Company. Are you surprised that there is a lot of demand for performance cars?